From the mind of Dennis Anderson, the wild and wooly King Sling was born. The ultimate Mega Truck, born in Poplar Branch, North Carolina, has a wild side, combining the brute power and durability of a monster truck with the madness of a mud racer. King Sling is a beast, and JConcepts has worked together with designers and builders to replicate this body shell to fit on a host of popular chassis including the Axial SMT10. The three piece body design offers the highest quality in detail giving the builder several options, replicating the original King Sling or even creating a unique RC Mega Truck identity. No superstar race machine would be complete without decoration. 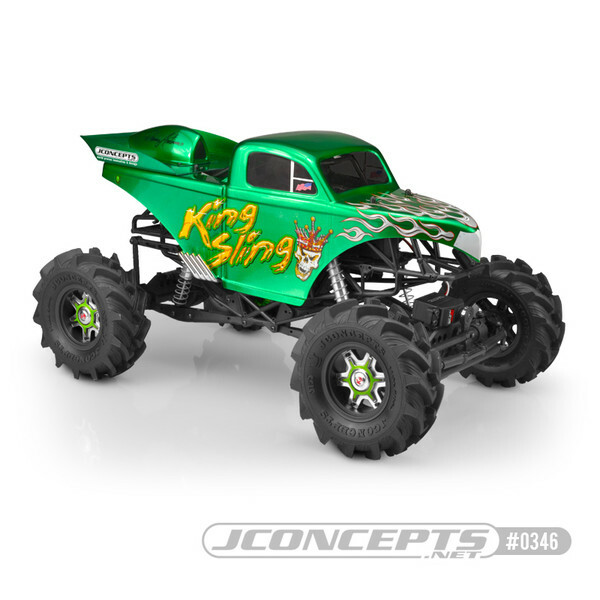 The King Sling is the first JConcepts body to include two decal sheets in the package that covers logos, signatures, flames and branding recognition. The product is formed in durable polycarbonate and includes painting window mask for ease of use. Fine detailing and trimming to the body shell comes from the purchasing enthusiast where the imagination and skill set takes over. Included in the package, clear King Sling body, painting window mask, rear wing, scoop, mounting hardware and decal set. As always, each body set is backed with JConcepts customer support and racing heritage. Tackle the RC world fit for a King. The vehicle is shown using the JConcepts (#3155) Fling King tires and (#3179) Dragon wheels. The 2.6” wheel diameter and matching tire is the perfect compliment for any mud run, dirt track or grass field conditions. Note: If wanting to replicate truck below, you will need to 1st use Tamiya PS-17 paint and then back that with Tamiya PS-22 paint. Shipping Charges: Our standard shipping charge for this product is $8.50 for the 1st item and $4.00 for each additional body purchased.